ON THIS PAGE: You will find drawings of the main body parts affected by CML. Use the menu to see other pages. This illustration shows a detail of the human skeleton. 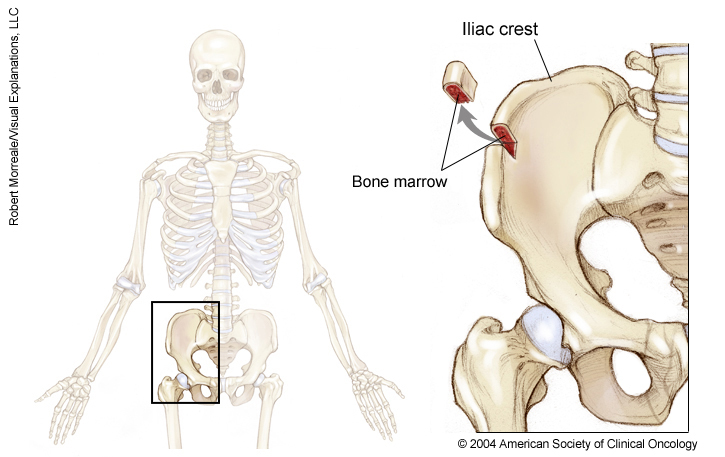 A section cut out of the outer edge of the hip bone, called the iliac crest, shows a thin outer layer of bone surrounding the bone marrow, a spongy, red tissue. Copyright 2004 American Society of Clinical Oncology. Robert Morreale/Visual Explanations, LLC. 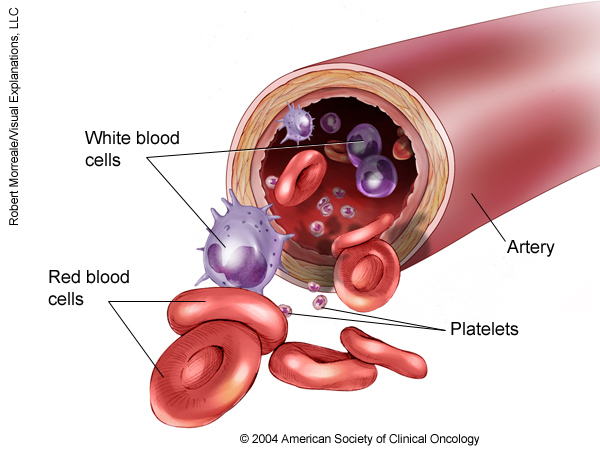 This illustration of an artery shows various types of blood cells, including the flattened red blood cells, multiple types of white blood cells, and the much smaller platelets. Copyright 2004 American Society of Clinical Oncology. Robert Morreale/Visual Explanations, LLC. The next section in this guide is Risk Factors. It explains the factors that may increase the chance of developing CML. Use the menu to choose a different section to read in this guide.